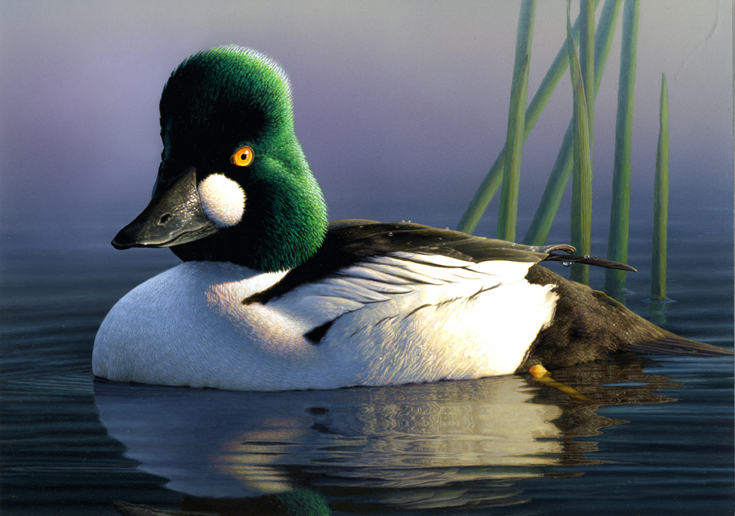 On a still winter afternoon, you may hear Common Goldeneyes flying low across the water. Whistlers, their wings sibilant, make the sound - as Ernest Hemingway wrote - of ripping silk. 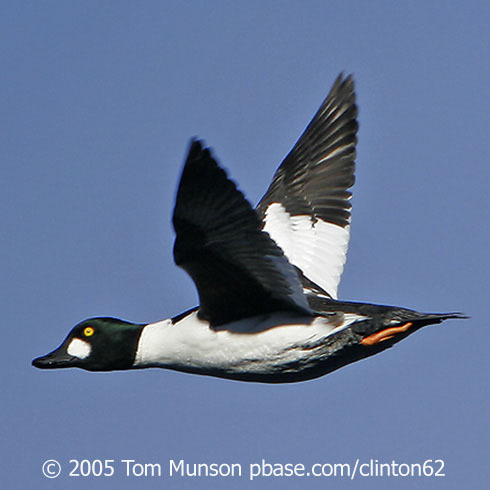 Common Goldeneyes nest in cavities, in northern boreal forests. Enjoy seeing the birds of BirdNote every day in the 2019 calendar. Check it out and order today! You may get to know these birds by sound as much as sight. On a still winter afternoon, walking the shore of Puget or Long Island Sound, you’ll hear them coming low across the water. Goldeneyes, also known as “whistlers”, their wings sibilant, making the sound, as Ernest Hemingway wrote, of ripping silk. You’re likely to see their piercing golden eyes and the striking domino black-and-white of the male’s plumage as you board a ferry or travel by boat along the shore. Sometimes in squadrons, they dive for crustaceans and mollusks. Autumn brings both species of Goldeneyes, Common and Barrows. You’ll know the male Barrow’s by the half-moon of white between its brilliant yellow eye and short bill. Enjoy them now while you can. 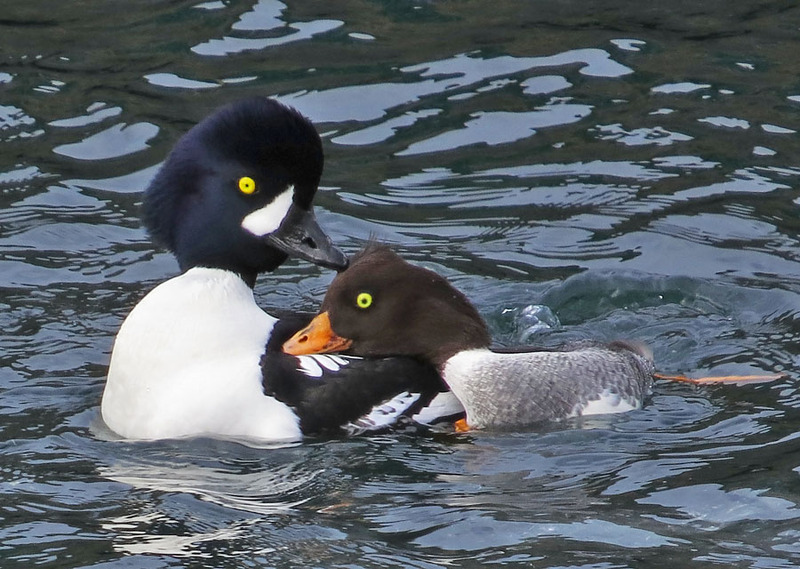 In spring, goldeneyes will be gone, returning to the boreal forests of Canada and Alaska to breed and hatch their young in the cavities of trees. And you’ll have to wait until next November to hear again the music of their wings. Celebrate a full year’s worth of birds with the “Birds of BirdNote” calendar. Available at birdnote.org. I’m Michael Stein. Sounds of the Barrows Goldeneye provided by The Macaulay Library at the Cornell Lab of Ornithology, Ithaca, New York. Recordist WWH Gunn.